When it comes to fashion, the Kardashians are pretty much the rockstars of it. And while most people generally think of the five sisters, their kids have also definitely come a long way, and deserve some attention. Today we will take a look at Kourtney Kardashian and Scott Disick's kids: Mason, Penelope, and Reign. In particular, we will evaluate some of their best baby looks, because fashion truly does start at a young age. And while Mason is the oldest and likes to rock more classy looks, don't be fooled and think that little P doesn't have a fashion trick (or two) up her sleeve. The middle kid loves to rock extravagant looks, and some of them are so out-there that they became iconic. But let's not forget about the youngest kid, Reign, because he may not have been here for a long time, but he is definitely the most effortlessly fashionable one out of the bunch! Some of his looks are probably our favorites on this list (especially the one with grandma Kris). Okay, now sit back, relax, and let these ultra-cool kiddos inspire you! Here are Mason, Penelope, and Reign rocking some ultra-cool baby fashion! When it comes to Kourtney's youngest child, little Reign, really loves being comfy, and you can tell that by the clothing he usually wears. The little fella is mainly seen rocking simple T-shirts and comfy pants, because at the end of the day, being carried around is nicest when one is pretty much in PJs. Anyways, here he is looking all cool in a grey shirt and black pants, because Reign knows that sporty is the pretty much the new chic. And so does his mama Kourt obviously! Either way, the two look absolutely adorable in their kinda matching sporty outfits! The middle sister in the family, Penelope Disick loves experimenting with fashion. Here she is wearing a gorgeous floral top, but do not be fooled, this little girl is not to be messed with! Penelope knows her fashion ABC's like no other Disick kid, and we bet both of her brothers always learn a thing or two from her. Not to mention that, honestly, her looks do often serve as inspiration for totally grown women (yup, we're admitting to having copied one or two looks of hers already). Are we surprised though? The Kardashians are kind of a fashion cult, and all of them serve us as inspiration! Mason, the oldest kid in the family, definitely takes the most after his father Scott Disick. Here he is spotted in a stripped hoodie, a look today's Mason still loves sporting. The look is super comfy, yet a bit more fun than just plain neutrals, as the stripes give it a funky vibe. Being the oldest kid in the family meant that Penelope and Reign learnt a lot of fashion tips from Mason, and that is surely something he can be proud of. Yeah, yeah, we know it's probably Kourtney who dresses them anyways, but imagining them competing against each other in fashion is kinda fun! Penelope, or Little P as everyone likes to call her, has definitely a fashion mind of her own. Seriously, the kid always looks so sassy and ready to conquer the world, that we like to imagine that Kourtney actually matches her outfits to Penelope's, and not the other way around. Well, anyways, here they are, both in checkered red shirts, jeans and brown booties! Definitely a great mother-daughter partner look, and one that is so easy to recreate. Besides, a checkered button-up should be a staple in everyone's closet, regardless of gender or age... and little P already knows that! Yes, one coordinated outfit in this list wasn't enough, we had to include another. Here's little P again, matching her mama perfectly. Seriously, and all-white look is another closet essential, whether you're a 6-month-old baby or a 30-year-old woman. Having certain essential looks like this one makes those days when you don't know what to wear that much easier. You just pick a look you know works and voila: you're ready to conquer the day. And if you happen to also have a baby, why not dress them accordingly as well, a partner look well-executed is never out of style! Out of all three of Kourtney and Scott's kids, we do have to say that little Reign has sort of managed to be the coolest one, even though he's the youngest. Maybe it's model auntie Kendall Jenner's influence, or maybe the little one just has a natural knack for it, but Reign definitely managed to look the coolest at the youngest age. Here he is sporting the super trendy oversized denim jacket look, and honestly, we've never been more jealous of a baby's outfit. And guess what, in accordance with his signature style, the little fella is still super comfy! Penelope on the other hand likes to experiment with looks more, one day you'll see her wearing a girly and floral dress, the next she'll be ultra cool in a leather jacket. And here she is mixing an innocent, white dress and tights with a biker jacket that screams: do not mess with me sir! Yup, little P managed to out-dress everyone once again, and honestly, she probably wasn't even trying to. Either way, no once should mess around with this little lady, because (judging from her outfit and her look) if they do they are bound to get in trouble! When in doubt, stick to a classic look. And in this case Mason did exactly that by wearing this gorgeous and classic Burberry sweater. Can we all just agree that Mason can rock a preppy look just as well as he usually rocks his sporty ones? Seriously, the little boy is better dressed on this one occasion than most men we know are their whole life, and that tells a lot. Keep on being a young fashion icon Mason, and keep on making your dad proud, because knowing Scott he must love seeing you look like a ~ Lord Disick's ~ son! But hey, if you though Mason can pull of the preppy look, wait till you see Penelope in her adorable Burberry skirt! Yup, being the sassy queen she is, she was definitely going to make sure everyone knew that what Mason can do, she can do way better, and all at a younger age! Once again, she kinda coordinated her outfit to her mom's - because that's what girls love to do, and she proved to all of us that she can rock any style out there, and still look as fab as always. Mark our words, one day little P will be a major trendsetter - we said it first! Now let's check on Reign again. Here he is sporting a cool, "I don't care" vibe, slightly sporty, slightly rocker, just like his mom Kourtney. And to top the look off, and add it that extra touch of wild, he opted for leopard-printed sneakers. Little Reign knows that a full outfit of animal print is surely an overkill, but wearing just the right amount of it can transform a look from everyday to "hello I'm a star look at me." Please don't change Reign, and keep on serving us these amazing looks, because we will definitely copy them in adult size! Alright, if you thought Reign owns the shoe game, think again, because where do you think he learned how to pick and match his shoes from? Yup, it was 100% older brother Mason, who rocked the statement shoe trend way before both Penelope and Reign were even planned. Mason knows the key to not overkilling it, and letting the shoes take the focal spot is to keep everything else neutral and monochromatic, if possible. That way the eye immediately goes to the funky shoes, and everyone is bound to compliment him on them. Yup, Mason played this game way before Reign did! Penelope loves to rock a classic look when she's not feeling the edgy or sporty vibes, and in that case she usually opts for the classics: a button-up shirt and a pair of nice pants. And honestly, this is something everyone can (and should copy). These two are pretty much closet essentials, and one pair of colored pants can be combined with a bunch of patterned button-ups. This look is perfect for those days when your baby just doesn't know what to wear, so try suggesting this. And by suggesting we mean just put the outfit on them and pretend it's them who has the impeccable fashion sense, not you. One thing that Penelope taught us is that babies can, under no circumstances be overdressed. Seriously, everyone loves babies and no matter how extra and over-the-top their look might be, everyone will still think they're absolutely adorable! Which is why this time in one's life needs to be used to experiment with avant-garde fashion as much as possible! Okay, still do make sure it's ultra comfy, but other than that there are no limits to what you can dress your baby like, so ~ inspired by Penelope ~ feel free to go crazy and explore some more unconventional looks. They will still be adorable, don't worry! Remember how we said Reign might be the coolest of the three kids? We'll we're definitely sticking to that, simply because he somehow manages to make his fashion always look so effortless. Here he is with grandma Kris, cousin North and sister Penelope, and while North and P are definitely slaying the fashion game as well, little Reign is clearly serving us the best look here! With so many kids in the family, it must be hard to always be dressed well, but Reign is definitely good at that so far. No hard feelings, to North or Penelope, but this fashion face-off definitely goes to Reign! We already mentioned it once, but there's no harm in mentioning it again: Reign loves himself some ultra comfy clothes. Here he is sporting a matching Adidas tracksuit, and he's showing us all that he can still look great while pretty much wearing pajamas. But enough about his fashion, can we just appreciate his two signature Kardashian braids? Yup, Reign is out there breaking gender stereotypes that say only girls can wear braids, because guess what? He wears them and he does not care one bit what anyone else things. This kid has more cool in his pinky than most of us in general. Yup, Mason is also an advocate for comfort comes first. Here he is spotted wearing a gray sweater with some vibrant red sweatpants and pretty cool socks. You can say what you want, but out of these three kids, Mason definitely has the most timeless style, as his looks seem to work for any age and any era. While we generally attribute fashion to the Kardashian side of the parents, in this case we do believe that Scott had and still has a major role in how his kids developed their fashion sense, because he does himself have a unique style. Okay, last thing we want to talk about are head accessories aka Penelope's best friends. Seriously, the little lady loves some adorable headbands and hats, and can we blame her? She looks super cute wearing them! Here she is rocking a white headband with some jewels and feathers, because why the heck not? Does one need an occasion to go all extravagant with their head accessories? Of course not, that's just societal norms oppressing us. Wear what you want when you want to, and don't let anyone tell you you can't. Well except maybe for school and work dress codes. But other than that, you do you! If you though Penelope is the only one who can rock a hat or headband, think again, because while she may be the queen of it now, Mason did it way before her. Here he is with auntie Khloe rocking a Holiday themed elf hat. And you know what the best part of it is? He is having a great time while wearing it! Sure fashion itself can be fun, but more importantly one mustn't forget to have actual fun while wearing the fashion, and clearly Mason is very good at remembering that! Keep on being a great role model for your younger siblings, Mason! 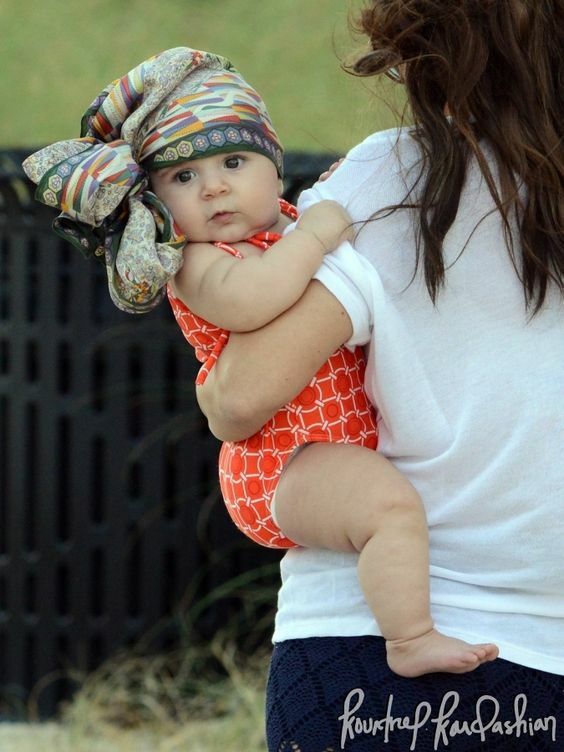 Yup, nobody ever rocked a headscarf as adorably as little Penelope did! It's patterned, its oversized and it's absolutely diva-like. Yes, you can take all the time you need to soak this photo in, it's not going anywhere. She truly is the family's winner when it comes to wearing things on her head, she does it well and she does it often! Penelope, please never stop, the world does need a head accessory queen! Now there you go, those were Kourtney's baby outfit essentials, we hope you found some inspiration for your own baby (or maybe even yourself - there's no prob with that).